As the PyeongChang 2018 Olympic Winter Games go into full swing, the best of the best from every country dazzle the world with their physics-defying exploits on ice in the figure skating events. Though the scoring system and commentating can seem archaic, fear not — the Smoke Signal happens to have two staff members who are student-athletes in the sport of figure skating. Staff Writer Karen Li started skating in 2013 as a fifth grader, and this sport has since become a huge part of her identity. She has taken part in multiple competitions, including Skate St. Moritz and the Central Pacific Regional Championships. She is currently practicing for the Senior Moves in the Field test, the final level of the series of official technical proficiency tests administered through the US Figure Skating Association. She trains three to four times a week in the mornings before school. Web Editor Jonathan Ko has been skating since he was four years old, and grew up stumbling through 6 am. practice sessions on Saturday mornings. He is a four-time Pacific Coast Sectional Championships qualifier and has passed the Senior Moves in the Field test, earning the title of US Figure Skating Gold Medalist. He currently practices much less than he would like, but still enjoys a study break on the ice once or twice a week. The International Judging System (IJS) is the most common scoring system for competitive figure skating. IJS is a point-based system that considers technical elements (i.e. jumps, spins, and step sequences), performance, musical timing, skating skills, and program composition. For all levels of competitive figure skating, skaters score points with technical moves called elements. These are assigned base point values based on difficulty, rewarding skaters for attempting more demanding elements. During the program, judges scrutinize the quality each element, especially the full rotation of the jumps, and give a grade of execution score (GOE) which ranges from +3 to -3. The GOE for each element is added to that element’s base value, and all individual element scoring is then added together to form the technical score. This system introduces a significant risk versus reward decision for skaters and coaches. Obviously, skaters would like to attempt the most difficult elements possible. For example, a quad flip is worth 12.30 points compared to just 5.3 points for a triple flip. However, more difficult elements tend to have lower GOE, so some skaters choose to attempt easier elements they know they can execute well. The most elite skaters, such as US Men’s Singles Skater Nathan Chen, are known for performing difficult elements with excellent execution. Overall scores also depend on the skater’s program as a whole. Judges look at expressiveness, choreographic flow, rhythm, and emotional projection from the skater. The Program Component Score (PCS) is calculated by using specific percentages, and judges are allowed to award up to 10 component points. This score is also known as the artistic score and rewards skating skills and depth of performance. The total competition score is the sum of the technical score and the component score. A final quirk in IJS scoring is that elements after the halfway point of the program are given a 10 percent bonus to base value to account for exhaustion. This also presents an interesting conundrum regarding element placement within programs: skaters must choose between performing their most difficult elements with full energy at the start, or milking every possible point with the risk of falling on tired legs at the end. At the Olympics, each skater has two routines in each event, one short program and one long program, also known as the free skate. Judges add up scores from both performances to decide the final standings. First introduced during the 2014 Sochi Olympics, the figure skating team event allows for a brief respite from the traditional individualism of figure skating. Each nation sends one contestant from each discipline to compete in the short program and free skate. Four disciplines are included: ladies single, mens single, ice dance, and pairs. In each event, contestants score points based on their ranking. 10 points are awarded for first place, 9 points for second, and down to 1 point for 10th place. All 10 participating countries compete in the short programs, but only the top five may advance to the free skates. After the free skates, the team with the most points wins. At the Sochi 2014 Winter Olympics, the US placed third behind champion Russia and second place Canada. The team event at the Gangneung Ice Arena wrapped up on Sunday. Here is a recap of how your favorite teams and skaters fared. Please note that the Smoke Signal is reviewing only the singles events, as our resident student-athletes have little expertise in ice dance or pairs. As is so often the case in the sport, the Olympic Athletes from Russia (OAR) dominated in the women’s short program event; two-time world champion and two-time Grand Prix Final champion Evgenia Medvedeva, 18, secured gold. Not only did she land her difficult elements, which included a triple flip-triple toeloop combination, Medvedeva displayed tremendous finesse and coordination with her music, Frédéric Chopin’s famous Nocturne in C-sharp minor. The entire program as a whole was breathtaking, demonstrating incredible artistry. Medvedeva placed almost six points ahead of second place skater Italian Carolina Kostner, another crowd favorite. Bradie Tennell, 20, skated as the US Ladies representative. Tennell placed first in the 2018 US Figure Skating National Championships with two clean programs. Skating to a musical compilation of selections from Taeguki Lee Dong-Jun, a Korean movie, Tennell stepped onto the Olympic ice showing no signs of stress from pressure. She started her program with a clean triple lutz-triple toeloop combination. Her other two jumps, a triple loop and double axel, were also executed perfectly, successfully achieving technical precision and full rotations. In addition, her spins were flawless, complete with picture-perfect extensions. She successfully secured a technical score of 38.94, an impressive score for her Olympic debut. However, Tennell’s program lacked emotion and artistic skills despite her error-free technical performance. Her edges in her choreographic footwork were shallow, and she showed little expression. Thus, judges did not find certain appeals in her program, awarding her with a component score of only 30.00 points, compared to Medvedeva’s 38.23. Nonetheless, with a total score of 68.94 for her short program, Tennell placed fifth overall among ten skaters, keeping the US medal hopes alive. Athletes from Russia extended their lead in the women’s long program on February 12. OAR competitor Alina Zagitova, at just 15 years old, performed remarkably well. Her technical consistency and emotional involvement in her program won the judges over. Her program separated her from the rest of the group because all her difficult jumps were at the end of the routine, a choreographic strategy to earn extra points. Judges awarded Zagitova 21 more points than second-place American Mirai Nagasu for Zagitova’s clean and well-executed jumps. Three-time Four Continents medalist and seven-time US National medalist Mirai Nagasu boosted the US overall ranking in the team event with her free skate program. Building upon her fourth-place finish at the 2010 Winter Olympics, the 24-year-old brought the crowd to its feet with her stirring performance. The men’s short program event marked the start of the 2018 Olympic figure skating competition. Japanese Skater Shoma Uno dominated the event with a score of 103.25, almost 15 points ahead of second place Israeli Alexei Bychenko. All of the previous skaters, plagued by Olympic nervousness, fell at least once in their performance, but Uno showed technical consistency throughout his program. He started out with an unstable quad flip, but he quickly recovered with a level-four combination spin. Uno regained his footing and secured the next quad toeloop-triple toeloop combination, immediately separating him from the other competitors. Uno’s overall artistry and level-three footwork added more points to his overall score. His 56.64 technical score easily outshined the competition, making him the top finisher of the event. Much-heralded American Skater Nathan Chen had a disappointing Olympic debut, earning large deductions on two key elements en route to a fourth-place finish in the event. 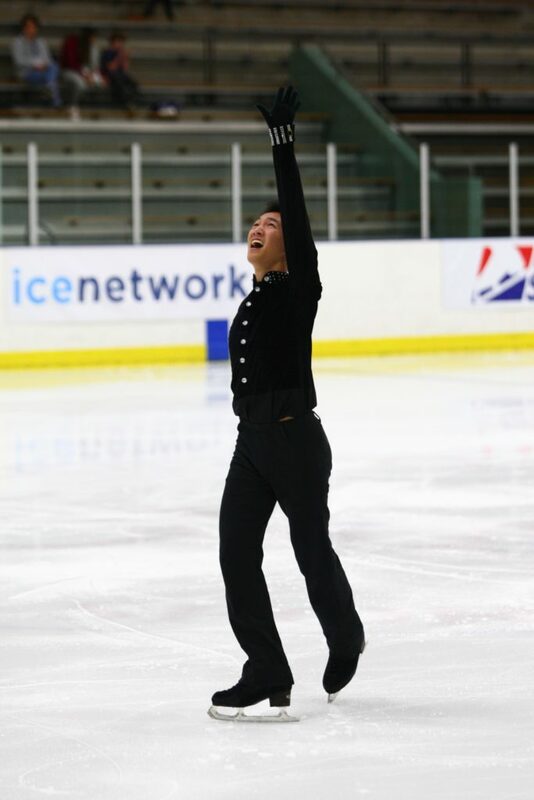 As the back-to-back US Champion and 2018 Grand Prix Final Champion, Chen rightfully earned the title of “Quad King” after becoming the first skater to land five quad jumps in one program. At the Olympics, however, Chen failed to execute a quad toeloop and fell on a triple axel, leading to an uncharacteristically lackluster technical score of 37.73. NBC Commentator Johnny Weir called the performance “abysmal,” and it may well have been Chen’s worst showing on the international stage. His total score of 80.63 still held for fourth place. As has been the case for years, the men’s event was decided mostly by which contestants could execute their quads the best. Canadian skater Patrick Chan won first with a score of 179.75. As soon as Chan nailed his opening quad toeloop-triple toeloop combination and another quad toeloop shortly thereafter, it seemed clear that he would win. Despite deductions on other elements and a fall, Chan’s superior artistry gave him an edge in the component score, which proved to be enough to separate him from the rest of the field. Though runner-up OAR competitor Mikhail Kolyada had mishaps on his first two quad attempts, he executed his other elements well with high GOE, giving him a technical score slightly higher than Chan’s. However, Kolyada’s lower component score landed him in second with a score of 173.57. US skater Adam Rippon rounded out the podium, skating a clean program with no falls. However, he attempted no quads, meaning that the difficulty of his program was much lower than his competitors. As such, as close to perfect as he skated, Rippon placed narrowly behind Kolyada with a score of 172.98. Rippon’s lone blemish, an under-rotated triple lutz in the back half of his program, could well have been the difference. Stay tuned for more expert review of the figure skating events in the coming days! 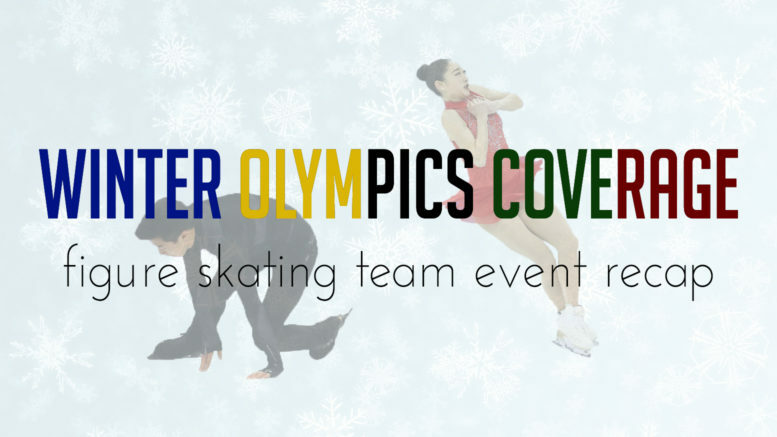 Be the first to comment on "Winter Olympics Coverage: Figure Skating Team Event Recap"